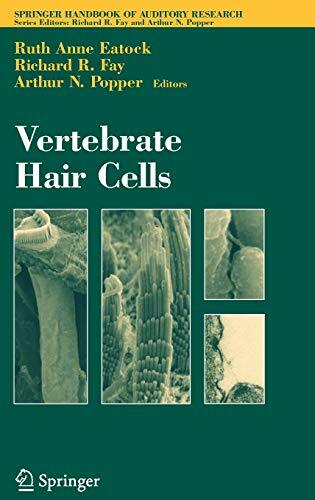 Vertebrate Hair Cells (Springer Handbook Of Auditory Research): 9780387952024 Hardcover - LIMEROCK BOOKS INC. The Springer Handbook of Auditory Research presents a series of compreh- sive and synthetic reviews of the fundamental topics in modern auditory - search. The volumes are aimed at all individuals with interests in hearing research including advanced graduate students, postdoctoral researchers, and clinical investigators. The volumes are intended to introduce new investigators to important aspects of hearing science and to help established investigators to better understand the fundamental theories and data in ?elds of hearing that they may not normally follow closely. Each volume presents a particular topic comprehensively, and each serves as a synthetic overview and guide to the literature. As such, the chapters present neither exhaustive data reviews nor original research that has not yet appeared in peer-reviewed journals. The volumes focus on topics that have developed a solid data and conceptual foundation rather than on those for which a literature is only beginning to develop. New research areas will be covered on a timely basis in the series as they begin to mature.